It’s no secret that the Internet has changed how we do everything since it took hold of the world. There’s a reason that improving the Internet is one of the FCC’s top goals. That’s not hyperbole; from shopping to music, reading to communication, the Internet has changed everything and here are the 15 websites responsible for changing everything, according to New Scientist. The funny thing is, while the website lists Google as the website that changed everything, Google isn’t even the most popular website in the US anymore. 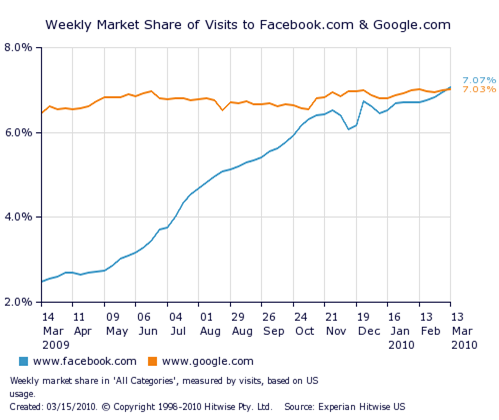 In fact, earlier this week, Facebook recently passed Google in total weekly visits. Google is listed as the site that changed everything, but the real title holder of that might be Facebook, which is poised to supplant Google as your one-stop shop for everything from image hosting to chatting with friends and beyond. Pretty much the only thing Facebook doesn’t do (yet) is search the web!